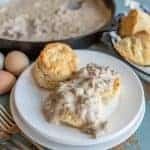 Biscuits & Gravy | The Easy Recipe I've Been Making For 20 Years! 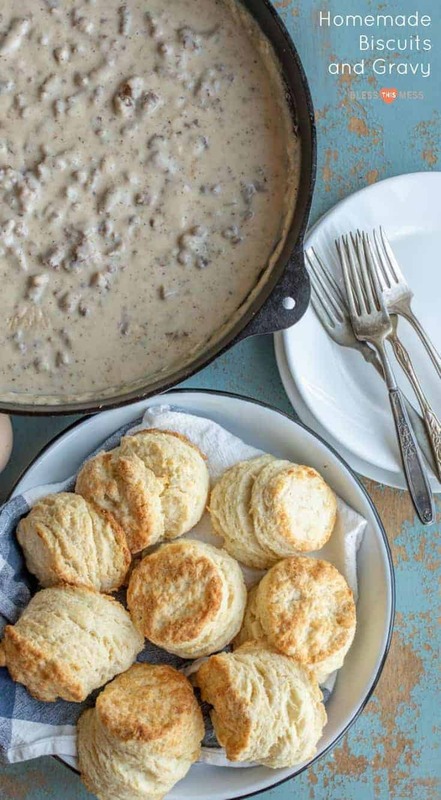 How to make homemade biscuits and gravy with just a few simple ingredients. It’s the perfect comfort food! Fun Fact: this was the first recipe I made in 7th grade Home Economics Class. Over two decades later, I’m still making this recipe regularly; it must be a good one. Biscuits and gravy is a staple in the Hoosier diet and one I’ve been eating, making, and loving since I was a kid. Since I’ve moved out west, I have found that lots of people don’t make it and in fact, they seem a little intimidated by the recipe. 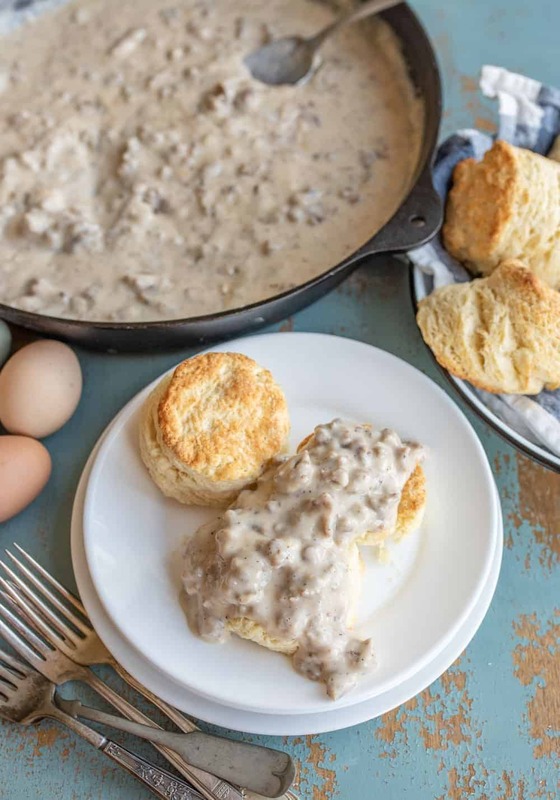 I am here to tell you that biscuits and gravy is one of the simplest dishes to put together. If a rowdy class of seventh graders can manage it, so can you. Biscuits and gravy is celebratory food in our family. We make this recipe for birthday breakfasts, when friends come to stay the night, and even on Christmas morning. I’m so excited to finally be sharing with you something that is a big part of the food culture in my home. 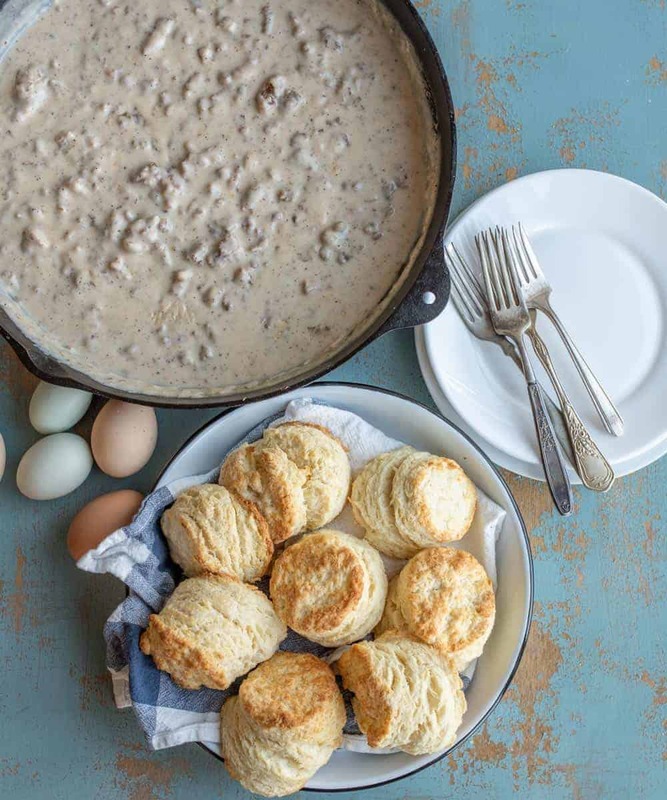 Few things are more delicious and comforting than simple homemade sausage gravy spooned over sturdy buttery biscuits. I hope you make this recipe over and over again like we do. I love this biscuit recipe, and I also love this buttermilk biscuit recipe. Take a look at them both and see which you’d like to make. I make them both often. The one I have shared here is a little easier in the sense that you don’t have to have buttermilk on hand to make it. After you add the milk to the sausage, you have to sit and stir a long while so that the milk doesn’t burn and stick to the bottom of the pan. This is a great job for little helpers with some supervision. You can use just about any kind or flavor of breakfast sausage that you like. I love using hot or maple sausage as well as the traditional. Pro Tip: here’s how to stretch one pound of sausage to make more gravy and feed more people. When the sausage is done browning, add a few tablespoons of butter. Let the butter melt and then double the rest of the recipe (make sure your skillet is really large!). Add 1 cup of flour and then 8 cups of milk. Double the biscuit recipe too. Still tastes great, uses less meat (that’s where the expense is), and it’ll feed a crowd! 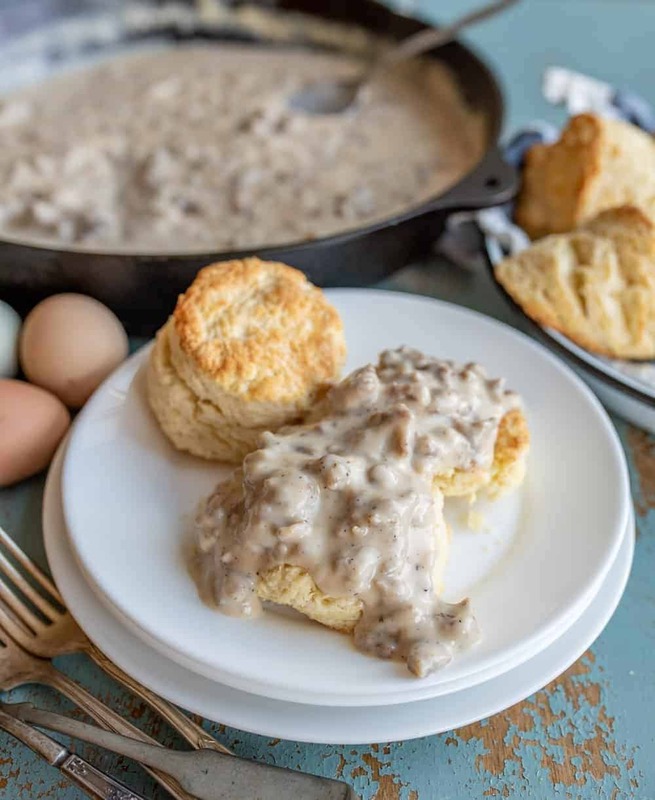 How to make homemade biscuits and gravy with just a few simple ingredients. I’ve been making this easy recipe for 20 years! It’s the perfect comfort food. Preheat oven to 475 degrees. In a medium bowl, whisk together the flour, baking powder, sugar, salt, and cream of tartar. Use a cheese grater to grate the butter into the bowl on the largest holes of your box grater. Stir butter into flour mixture. Stir until the butter is broken up and the mixture is well combined. Add the milk and stir until just combined – do not over-mix. Pat dough on a floured surface until it’s 3/4 inch thick. Cut into biscuits using a biscuit cutter. Place on an ungreased cookie sheet. Bake for 8 to 10 minutes until golden brown. In a large cast iron skillet (or other large skillet), add the sausage and cook over medium to medium-high heat until the sausage is cooked through and no longer pink, 8-10 minutes. Use a wooden spoon or spatula to break up the meat into small chunks as needed. Do NOT drain the grease that the sausage made while cooking. Use your spoon to spread the sausage out into an even layer on the bottom of the pan. Sprinkle the flour over the top of the sausage and then stir well to combine. Let the flour and sausage cook for 1-2 minutes, stir often. Whisk the milk slowly into the sausage and flour mixture. Continue whisking until the gravy starts to simmer, about 5 minutes. Keep stirring and let the gravy cook while at a low simmer for an additional 1-3 minutes, until it thickens. 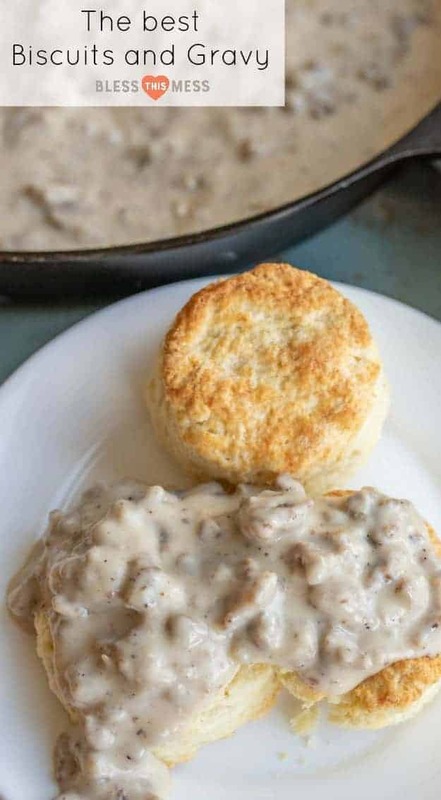 Serve the hot gravy over the hot cooked biscuits with additional salt and pepper to taste. After you add the milk to the sausage you have to sit and stir a long while so that the milk doesn’t burn and stick to the bottom of the pan. This is a great job for little helpers with some supervision. Long live great recipes that you’ll pass down to your kids and theirs. Simple delicious food at its best, indeed. Enjoy from my kitchen (and 7th grade HomeEc Class) to your kitchen.